Regina Bernal is an entrepreneurial business leader with an academic and professional track record steeped in innovation. As Entrepreneurship Manager for the University of San Diego (USD) School of Business, Regina spearheads major entrepreneurship initiatives for the University, including its V2 Pitch Competition, Legacy Entrepreneurship Conference and coaching and mentoring program for student entrepreneurs. Through the continuous enhancement of these programs, Regina has helped to create a network for budding entrepreneurs to become progressive leaders empowered with the ability to transform passion into enterprise. Her communication and bicultural background allows her to enhance USD’s cross-border relationships, particularly in Mexico, Central America and South America. Regina has developed a profound understanding of USD and its degree programs from the perspective of not only an employee but also a student, having earned both her bachelor’s and master’s degrees from the University in addition to her professional tenure with the School of Business. As she has developed personally and professionally, Regina applies experiential learning to her work with the University, ensuring the ongoing quality and global relevance of its entrepreneurship programs. Beyond her work at USD, Regina is an active member of the local business community and a thought leader in international business innovation. 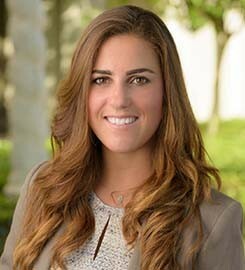 She has been a member of the San Diego Chamber of Young Leaders, a division of the San Diego Chamber of Commerce; a marketing advisor for South Doctors, a company dedicated to medical tourism; and a bi-national expert for Analytic Ventures, a venture capital firm that creates and invests in local technology companies. Her passion for doing the daring to impact our community has recently placed her among San Diego’s 500 Most Influential Business Leaders, 2018. Regina speaks regularly on the topics of leadership, innovation and cross-border relations. In 2016, she gave a talk at TEDxSanDiego on the power of innovation in multinational business relations, examining the border region of San Diego and Tijuana as a microcosm. Regina’s propensity for entrepreneurship is fueled by a life-long passion for learning and an innate ability to approach every situation as an opportunity. Bilingual in English and Spanish and bicultural in business, Regina possesses both the knowledge and empathy to optimize communications across geographies. She holds a bachelor’s degree in strategic communications and a master’s degree in leadership and is an avid yogi. Submit changes to Regina Bernal's profile.